Pope Benedict’s talk in Assisi today, on the 25th anniversary of the Day of Prayer for Peace summoned in the same place in 1986 by Pope John Paul II, was paradoxical and in some ways astonishing. The paradox: Benedict was speaking to a group of religious leaders, men and women representing nearly all the major religions of the world, but instead of praising religious faith unreservedly, and calling for more of it, he criticized it for often going radically off track in acts of violence, war, and terror. In short, at a meeting of religious believers, he criticized religious believers for losing sight of the very faith they professed, criticized them, essentially, for falling into error about the nature of God. The error of believing that God, the true God, could ever demand, or be pleased by, the use of force or violence against innocent persons. And so in his talk Benedict made an astonishing appeal to Christians to engage in a radical “purification” of their faith. For us the Cross of Christ is the sign of the God who put “suffering-with” (compassion) and “loving-with” in place of force. His name is “God of love and peace” (2 Cor 13:11). It is the task of all who bear responsibility for the Christian faith to purify the religion of Christians again and again from its very heart, so that it truly serves as an instrument of God’s peace in the world, despite the fallibility of humans. By speaking in this way of Christianity (the religion of which he is the supreme pontiff), and in doing so at the very center of his talk, Benedict was making it quite clear that he was not focusing his condemnation of religiously-justified violence on just one religion or just one religious group. And then Benedict went in a completely different direction. He posed the question of whether, since religious believers can sometimes go off track and become fanatical, and even commit acts of terror, it might be better if religion were simply suppressed, as many Enlightenment thinkers argued in the 1700s, in order to avoid religious hatred and religious war, and finally have peace, or at least more peace, on earth? Eliminating religious faith was not the answer, Benedict said. In fact, eliminating faith on God would only open the way to worse things. “The enemies of religion,” Benedict said, “see in religion one of the principal sources of violence in the history of humanity and thus they demand that it disappear. Here Benedict referred to the reign of Hitler in Germany (1933-1945), making it clear that he traces the violence of that regime to the elimination of religious faith, the elimination of God: “The horrors of the concentration camps reveal with utter clarity the consequences of God’s absence,” he said. So Benedict first criticized false religious faith when it becomes fanatical and violent, then criticized the attempt to eliminate religious faith because that elimination can lead to even more horrible violence. I said that there is a way of understanding and using religion so that it becomes a source of violence, while the rightly lived relationship of man to God is a force for peace. In this context… I spoke of the constant need for purification of lived religion. On the other hand I said that the denial of God corrupts man, robs him of his criteria and leads him to violence. Then, in a few remarkable, dense lines, Benedict proposed something truly astonishing. Having recapitulated his argument, Benedict dropped his bombshell: he spoke in praise, not of religious faith, and certainly not of atheism, but of agnosticism! And what he praised in agnostics was a certain mental and spiritual openness, coupled with the humility to acknowledge that they simply did not know what was the truth, which was more in line with truth than an attitude of complete, fanatical conviction. Such people do not simply assert: ‘There is no God.’ They suffer from his absence and yet are inwardly making their way towards him, inasmuch as they seek truth and goodness. “They are ‘pilgrims of truth, pilgrims of peace.’ They ask questions of both sides. These agnostics, not being believers, have a certain credibility with atheists, and not being atheists, have a certain credibility with believers, Benedict suggested. In fact, Benedict seems to present agnostics as a key form of social “leaven” in the human “dough” of society, helping to soften the fanaticism of believers who have gone off track and the fanaticism of atheists who vehemently deny even the possibility of a supernatural divine reality. They take away from militant atheists the false certainty by which these claim to know that there is no God and they invite them to leave polemics aside and to become seekers who do not give up hope in the existence of truth and in the possibility and necessity of living by it. But they also challenge the followers of religions not to consider God as their own property, as if he belonged to them, in such a way that they feel vindicated in using force against others. These people (i.e., agnostics) are seeking the truth, they are seeking the true God, whose image is frequently concealed in the religions because of the ways in which they are often practised. Their inability to find God is partly the responsibility of believers with a limited or even falsified image of God. So all their struggling and questioning is in part an appeal to believers to purify their faith, so that God, the true God, becomes accessible. We know that Benedict did truly mean what he said here in praise of agnostics, because he acted on his conviction that agnostics are in fact “people seeking the truth” — in an unprecedented gesture, he invited them to Assisi to participate in this religious summit meeting! 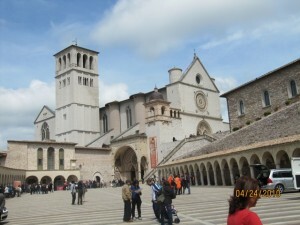 And this is precisely the point that Benedict is at pains to make as he closes his talk, saying that he consciously decided to invite agnostics — members of no religious faith — to Assisi, because he wanted seekers present along with those who had already found what they were seeking, becoming members of religious institutions. Therefore I have consciously invited delegates of this third group (i.e., agnostics) to our meeting in Assisi, which does not simply bring together representatives of religious institutions. Rather it is a case of being together on a journey towards truth, a case of taking a decisive stand for human dignity and a case of common engagement for peace against every form of destructive force. At a time when some would divide the world into two opposing groups and call our inevitable future a “clash of civilizations” (referring to the world of religious Islam on the one hand and of the secularized West on the other), Benedict here is sketching a very different and much more hopeful vision, a vision containing three elements, not two. It is a vision of a world with religious believers who can fall and have fallen into fanaticism and violence (including Christians), and with firm atheists who insist that there is not and cannot be a God, but also with agnostics who, moved by reason, in a sincere desire to arrive at truth, can assist each of the first two groups to escape from the “dead end” of their unreason. For this reason, today’s talk in Assisi is an important interpretative key to help us understand the Pope’s mind and his vision for the future of the Church, of Western culture, of the new evangelization, and of the way toward possible peace in our world.